The squash blossom necklace is a classic Navajo necklace. The necklace's design is a symbol of acculturation. 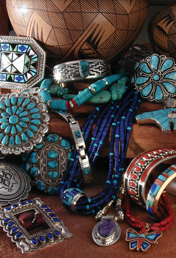 Its design originates from early Spanish and Moorsish symbolism and with these cultural influences the squash blossom necklace emerged as a symbol that is uniquely Navajo.The necklace's design can be disected into two parts: the squash-blossoms and the Naja. The necklace is typically a strand of beads, sometimes two. Interwoven with these silver beads are squash blossoms: silver bead with an attached silver flower-like blossom. In the language of the Navajo, they are called "yo ne maze disya gi," which is translated into "the beads that spead out." In the squash blossom necklace usually there are five to seven of these on each side. Read More About Squash Blossoms Necklaces.